North Korean Diplomat In Italy Goes Into Hiding, Says Intelligence Agency South Korea's spy agency told lawmakers in Seoul on Thursday that Ambassador Jo Song Gil escaped the North Korean embassy in Rome with his wife in early November. 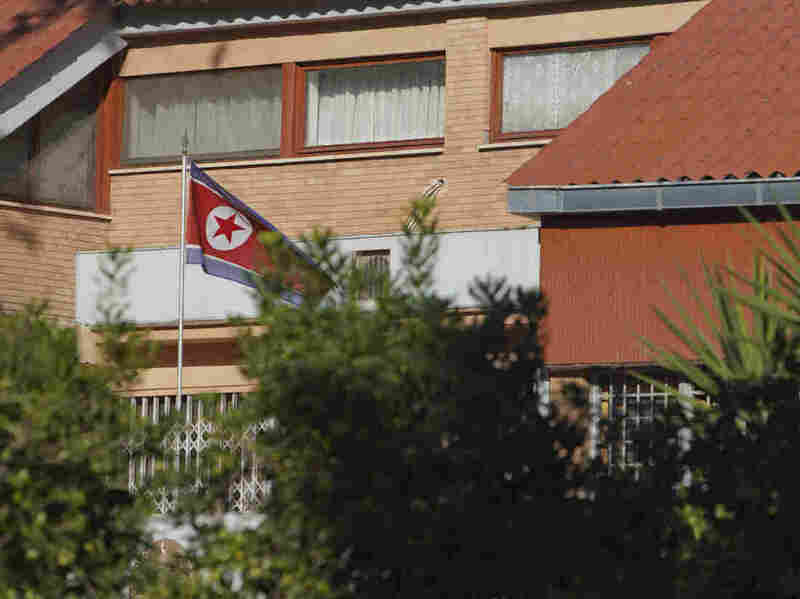 The flag of North Korea waves inside the compound of the North Korean embassy in Rome. North Korea's acting ambassador to Italy, Jo Song Gil, went into hiding with his wife in November, according to South Korea's National Intelligence Service. North Korea's acting ambassador to Italy has disappeared from the diplomatic compound in Rome, according to South Korea's spy agency. NPR's Seoul Correspondent Anthony Kuhn reports the South Korean National Intelligence Service briefed lawmakers in a closed-door hearing Thursday. Ambassador Jo Song Gil and his wife disappeared from the diplomatic compound in Rome in November, before his term was set to end later that month, Kuhn reports. South Korea's Joongang Ilbo newspaper reports that the 48-year-old Jo has sought asylum in the west, but Rome has not confirmed this detail. "The defection of a senior diplomat would of course be a major embarrassment for Pyongyang," Kuhn reports. South Korean lawmaker Kim Min-Ki told reporters he has information about the case, but cannot discuss it, according to Reuters. "They left the diplomatic mission and vanished," Kim said. The Italian foreign ministry says it knows nothing of reports that a North Korean diplomat has defected and is seeking asylum, reports NPR Senior European Correspondent Sylvia Poggioli. She says Italian media reports that the Rome foreign ministry "denies he's in protected hiding." The Associated Press reports that North Korea has yet to comment on Jo's status. North Korea has long been concerned about the possibility of defections, especially among its elites. The secretive country has insisted in the past that diplomatic defections are South Korean or U.S. plots to undermine its communist government, reports the AP. According to Corriere Della Sera, most North Korean diplomats are required to leave their families at home in order to discourage defections. Jo became acting ambassador after Italy expelled the former top diplomat in October 2017 to protest a North Korean nuclear test, Poggioli reports. North Korean defection is nothing new. NPR has previously reported on soldiers, journalists and human rights activists who have escaped the regime. The last high-profile North Korean defector, the No. 2 diplomat in the U.K., escaped to South Korea in 2016.